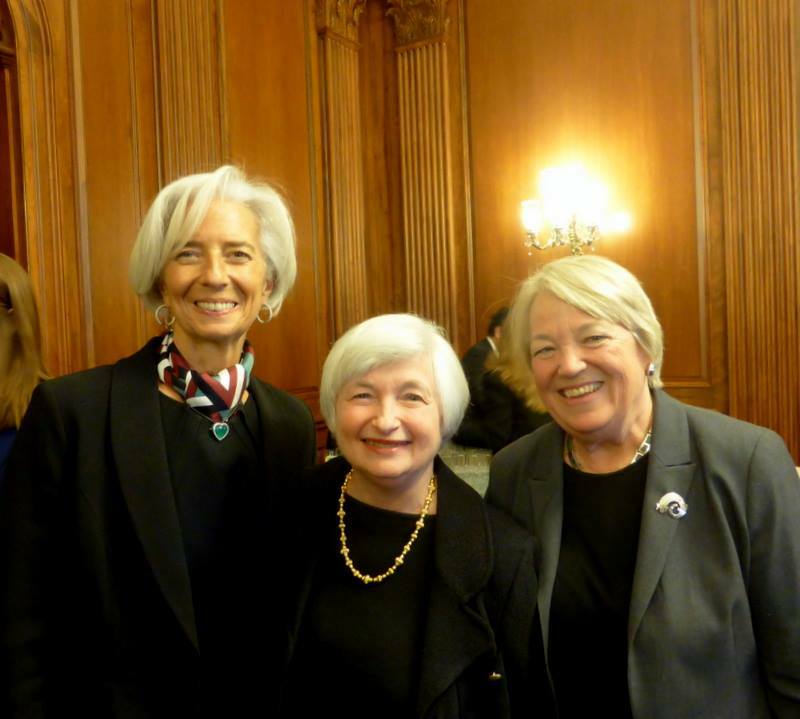 IWPR President Heidi Hartmann (right) with IMF Managing Director Christine LaGarde (left) and Fed Chair Janet Yellen (center) at Chair Yellen’s ceremonial swearing in ceremony in Washington, DC on March 5, 2014. Last week, at her ceremonial swearing in at the imposing atrium of the Federal Reserve Board in Washington, DC, Janet Yellen gave a remarkable speech. Short—less than 3 pages double-spaced—it nevertheless conveyed what Chair Yellen brings to the table. She moved on to mention the steps the Board has taken to strengthen financial regulation and the steps it will take to implement the Dodd- Frank Act. She promised to continue former Chairman Bernanke’s movement toward making the Federal Reserve more transparent and accountable through further improving communication with the public. These remarks echo those by Bernanke in 2010, when he emphasized the need for stronger regulation of the banking system to prevent another crisis and the role of improved communication with the public in restoring the public’s faith in the banking system. But there were also several parts of the speech that revealed something about where her passions lie and how the Yellen era at the Fed is likely to differ from previous tenures. Then, she devoted the second-longest paragraph in her speech to extolling the skills and dedication of the “men and women” on the Fed’s staff, emphasizing their integrity, tireless work, creativity, and perseverance. For me, an economist who has dedicated my life to advancing the status of women, experiencing first-hand Janet Yellen’s elevation to this leadership position—making her arguably the most powerful woman in the world—was deeply moving. Indeed, the swearing-in ceremony—in which her oath and speech were joyfully acknowledged by cheers and applause from the gathered guests and the many staff members crowding every inch of the Fed’s atrium, balcony and sweeping stairways—epitomized the rationale for the struggle to win such high for places for women. They often bring a different perspective to leadership, based on a lifetime of difference. A difference that tends to put people first. Heidi Hartmann, Ph.D., is an economist and president of the Institute for Women’s Policy Research.